Please keep in mind that the most comfortable mammograms should be scheduled about 10 days after the start of your menstrual cycle. This insures the least discomfort that swollen or tender breasts may pose during other days during your cycle. 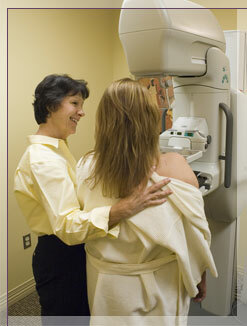 Please do not use deodorant the day of your mammogram. This is to prevent your deodorant from showing up as spots on your mammogram. The technologist will ask you to undress from the waist up. Please take this into consideration when coming to your appointment. Wear blouses or shirts that can be removed rather than one piece dresses. You will be provided with a gown for your convenience.